The block diagram below presents the CSN F9’s flight control system. The ship’s Inertial Navigation Units (INUs) collect and feed the necessary real-time inputs (attitude, location, velocity, mass, center of mass location, moments of inertia). The flight planner provides the reference trajectory data for the flight guidance system (master autopilot). At the center of the system the attitude and thrust controllers effectively command the ship’s thrusters. ← The pilot configures the whole flight controller by selecting the respective attitude and thrust modes. The flight guidance autopilot automatically engages according to the selecting settings and reference flight plan schedule. The Attitude Controller is a feedback system that manages the ship’s pitch, roll and yaw angles using MRU rotational thrust (torque) and thrust vectoring on the main engine when available. 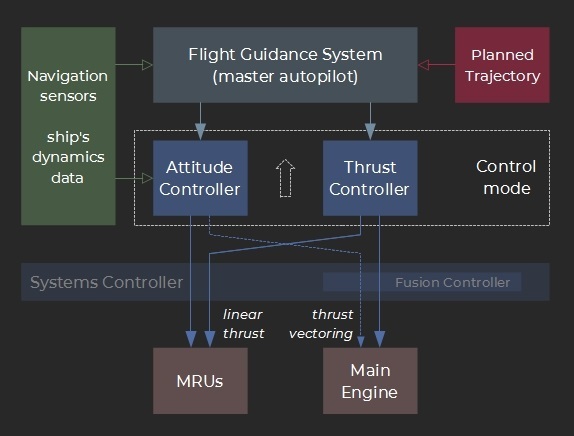 The Thrust Controller translates the pilot and flight guidance inputs into commands to the MRUs (linear thrust) and fusion controller (main engine thrust). The Flight Guidance System is the ship’s master autopilot. When active it takes dynamic command of the attitude and thrust controllers to maintain or bring back the ship on to the loaded reference trajectory. The small central panel below the AIM attitude selector provides information on its current state, estimated current error (aggregated as [m]) and the currently applied thrust corrections. Although the attitude controller’s user inputs are split into two ROLL and AIM (pitch + yaw) selectors, it internally operates as a unified 3-axis system. Its stability parameters are automatically adjusted depending on the allocated thrust (torque) and estimated moments of inertia. The “∫ε” symbol on the front panel (top-right of the AIM selector) indicates that an additional integrator has been activated to optimize the pursuit performance. By default (“thrust axis” button) the ship’s reference frame is defined using the main thrust axis (~ main nozzle to center of mass) and not the geometrical longitudinal axis. This is to dynamically compensate for mass imbalances from the main LH2 tanks (primarily). Tracking a point under acceleration from multiple forces (thrust, gravity) is not an easy task for regular feedback systems such as PIDs. As a result the flight guidance system is based on a Model Predictive Control approach. 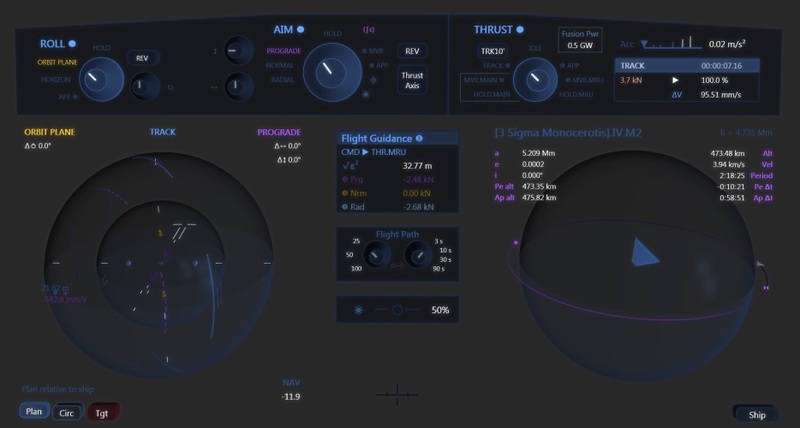 In practice it uses a model of the current flight conditions to search for thrust commands that would minimize the ship’s position and velocity error when propagated some time ahead in the future. This process is continuously repeated several time per (real word) second. The Maneuvering Systems panel (helm station) regroups the MRU related controls. with LIN + ROT ≤ 100% (e.g. 20% / 20% is a valid setting that limits the total allocated thrust). The Power Saturation slider controls the allocated electrical power as a function of the commanded thrust. The default setting will offer better ISP at low thrust as a trade-off with power consumption. Note: the term “maneuvering” may be misleading considering that MRUs are powerful engines in their own right and can draw large amounts of electrical power from the ship’s electrical system. Due to their relatively low ISP they may also consume large amounts of hydrogen and significantly affect the overall ΔV budget. As a general rule: the lower the commanded MRU thrust and impulse, the better. The primary inputs governing the ship’s attitude (roll, aim = pitch + yaw) and thrust mode. The flight guidance system (full autopilot) automatically engages based on your settings and the loaded flight plan. Indicates the current orbital elements and provides a 3D view of the ship on its orbit with respect to the parent body. The mode and its intended use. Whether the main thrust is produced by the main engine or the MRUs. The corresponding Attitude and Thrust settings to be selected on the front helm panel. Whether the flight guidance system is active for the mode or not. There is no such thing as approximate space flight if one wants to get anywhere. Typical trips involve a few jumps and tenths of trajectory legs and maneuvers. At each step any small position or worse velocity error will always accumulate and eventually make the following steps irrelevant. This is why it is much more efficient to plan first and then to use the flight guidance system to stay on track all along to the destination. The following video presents the CSN F9’s flight control systems in a simple example burn.